Vegan Inspiration: August Recipe Round-Up! In case you missed them, I've been blogging vegan recipes + tips all month long over at Babble.com's Family Kitchen blog. And some amazing vegan bloggers have been submitting their posts to my other site FindignVegan.com! Vegan Inspiration Galore. Check out the recipes you may have missed this month. This round-up is perfect for some Meatless Monday inspiration!.. 3. 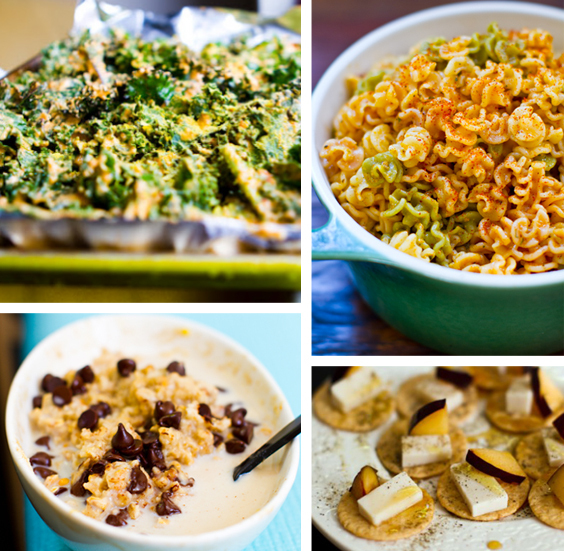 Meatless Meals: 14 Meatless Meal Recipes for back to school! 5. Dessert Oatmeal: Dessert-Inspired Oatmeal - recipe round-up! 6. Smile: Adorable Kids Lunches! Kid-Approved Creative Veggie Bentos - this round-up of ADORABLE lunches is not to be missed. Smiles will happen. 7. Smasher: Peanut Mandarin Lunch Rice Bowl - a smashing way to make a healthy lunch happen. 8. Smoothie! Blueberry Peach Grapefruit Smoothie - super refreshing. 9. Pasta: Quickie Lemon-Cajun Pasta - cheezy with nutritional yeast! 10. Bowl: Peanut Butter Rice Bowl + Tofu - fast, delish and easy. 11. Oats: Chocolate Cookie Dough Oatmeal - surprisingly healthy! See the nutritional facts. 12. Raw Treat: Raw Building Blocks + Fruity Shapes - had to share this creative kids recipe from Anya of G0lubka. 13. Kids Drink: Colorful "Cool" Aid .. shared this healthy version beverage by Lexie's Kitchen. 14. Contest!.. Enter Pure Bar's Vegetarian Recipe Contest: details on Family Kitchen. 15. Kid Smoothie: Green Smoothie for Kids! Shared from For the Love of Food Blog. 16. Still Hot? Check out my 5 foods to endure a hot month. Coconut water is one of them. 17. Fancy Bite: Plum + Pepper +Jack "Cheese" Bites - a summer-infused appetizer or snack. Perfect with wine! more recipes featured above: Kale Chips, Cajun Pasta, Dessert Oatmeal, Plum Jack Bites.. 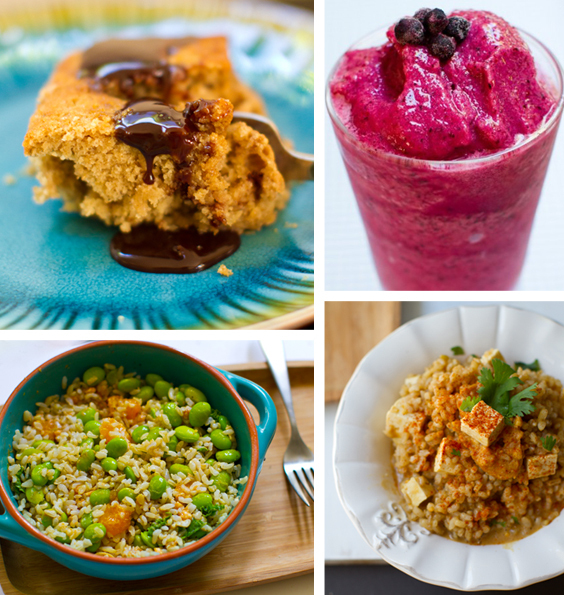 The Top "Heart-ed" Recipes + a few of my personal faves.